Brookdale House publishes a variety of child centered learning products. We chose to review from the Geography Drawing Series, Drawing Around the World: Europe. We are currently studying various countries around the world and the Missionaries to those places. I wanted to utilize Drawing Around the World Europe to be incorporated into our studies. Just looking at the country on the map doesn't cement into their mind where it is located. I desired more for our studies. Drawing it over the course of a week really helped them to memorize not only where it was, but the shape of it and it's relation to other countries we had studied. Plus my kids love to draw and that really helped them. The program build upon itself, taking countries from past weeks and adding to them. So you are in a constant state of review, and building upon knowledge. This really helps for the student to retain it. The geography program is set up for 4 days a week. Day one you study the country, including filling out a fact sheet (there are suggested links in the beginning of the book where you can safely find your information on the country). You outline your country on the map. You also include other countries you have learned up till this date. 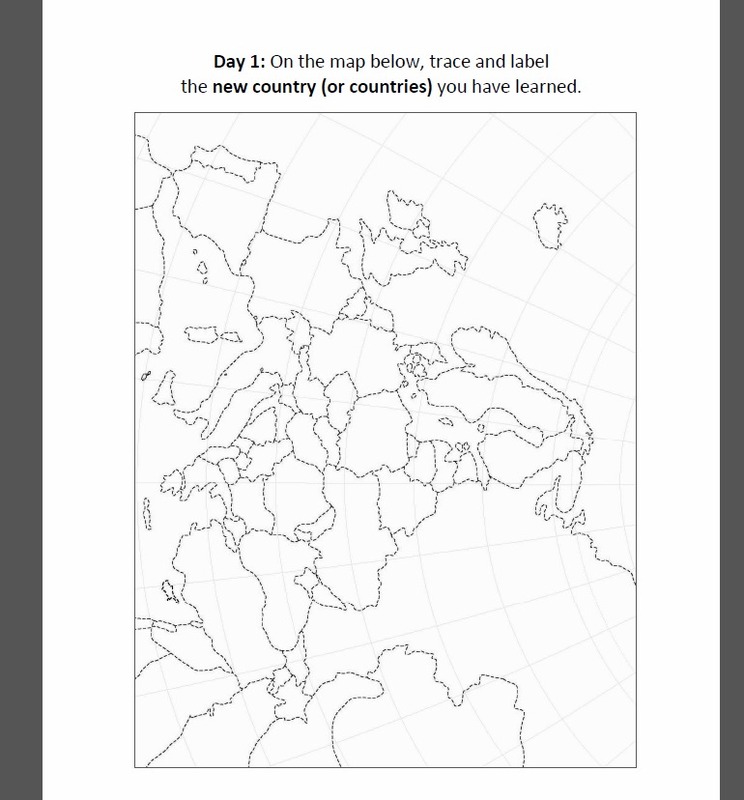 They you would draw the outline of the country you are learning on the second page, and include the other countries you have learned thus far. 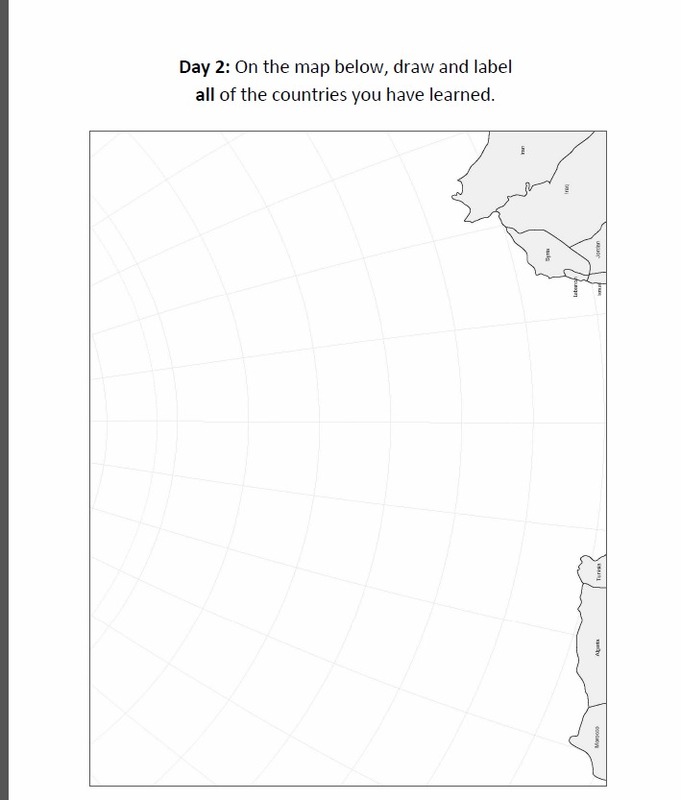 Day 2 is much the same, where you locate your country on the dashed line map and label. Then you draw and label the countries up to this point. The papers look identical, just have a different day on them. My example above was actually day 2. Day 3 is identical to day 1 and 2. 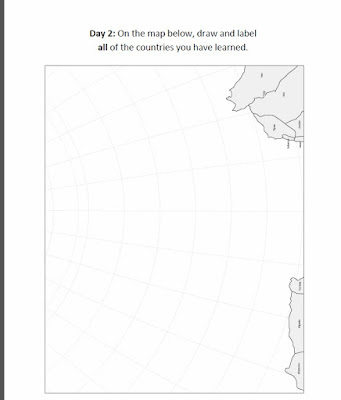 Day 4 is a blank paper where you need to draw your country and label it. As you progress you will have several countries to add to your map. There is an order for the countries but we didn't follow that. If we were utilizing this primarily for geography as our main source we would follow the weeks to make it easier on us. It helps group countries near each other for ease of learning and drawing them. You can easily use this as a spine for your country studies. Starting with Iceland the first week and Norway for the second. 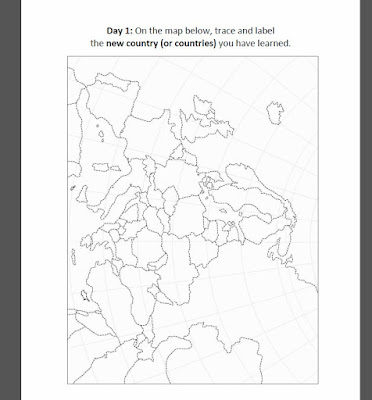 You could add to this program more information on each country and create a unit study even with the Drawing Around the World being your spine of which order you study. We started with Russia because that was what country we were in for our missionary studies. I love that I could use this in addition to what we were doing, not just having to use it as the main curriculum. This particular book is just Europe and I would have loved to have Asia included simply because not all of our mission studies are in Europe. I would love to see one for each of the continents. They do have the USA which is great for learning your states! Brookdale House also has products on Writing Through History, Writing from Rhetoric, Bible Memorization tools, Spanish, Grammar and more. Check out their website for a variety of products to use in your homeschool. Many of my Crew Mates review different products from Brookdale. See their thoughts by clicking on the banner below.